www.BrianWhittaker.com [Airborne Images] -"Photo of the Month"
Dust Devils are almost always visible on the road between Phoenix and Tucson, Arizona in the afternoon. It is difficult to make the journey without seeing at least on in the distance. The desert plain seems perfect for their formation even in cooler temperatures. 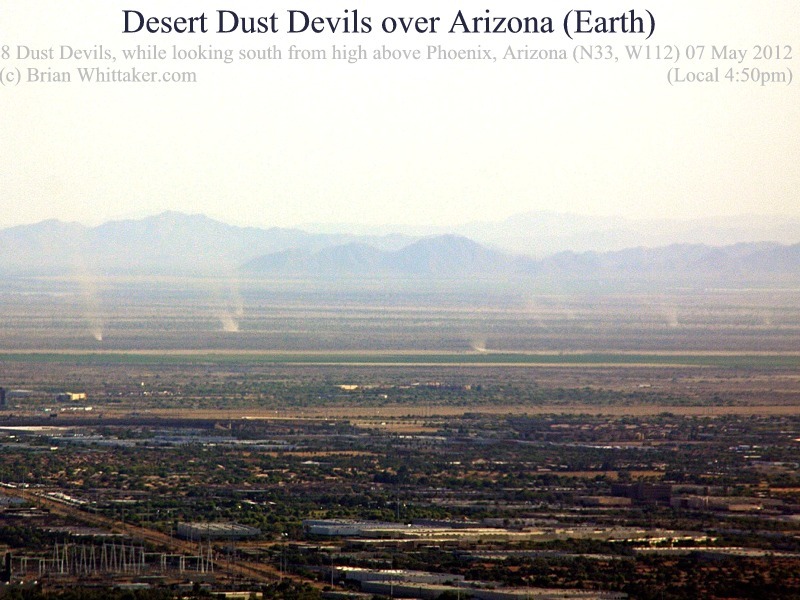 In the afternoon of Monday 7 May 2012, I photographed [800x600] eight Dust Devils at the same time to the south from high overhead Phoenix. It made me think of the Dust Devils on Mars! 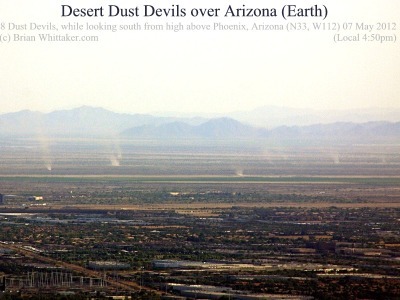 Dust Devils [wiki] are vertical vortices of air which carry dust up into the air from the ground, hence the term "Dust Devils". It is a simple consequence of heated air rising and starting to rotate as it rises. Although it is in some ways similar to a mini-Tornado, it is much smaller and more gentle. They usually appear on clear smooth sunny days.